Capt. Frank Hawkes was a lover of speed. He had won many races and was now employed by the Texaco Company as an exponent of their aircraft gasoline and oil. 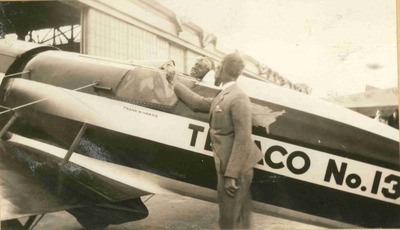 With a special Travelaire with low wings and beautiful streamlining he said goodbye to Bill Stout, the aircraft designer, at Ford Airport before leaving on a speed hop to New York. He made the trip in about 2-1/2 hours which broke all existing records for distance. I has already met Hawkes in California and wished him well before he took off. He is a pleasant chap and a rel fellow.